work related – Rants! And babblings! I was reminded this evening of a particular day at work in a job I once had. It was myself and two of my colleagues (all programmers) on the phone with two other guys, two other “programmers” (only this time with quotes). It took years for me to fully realize this, but there are people in life, especially in the corporate world, that can offer no useful products or services, apart from a real dexterous skill at the art of talking. While myself and my two other colleagues gathered these vendors together for a little chat to discuss some major design flaws in the product they delivered, the receiving party seemed to deftly avoid and turn on its head everything being said; they somehow turned an hour conversation into an hour signifying nothing: a brilliant art, a legerdemain of the mouth, a slight of tongue. It started off innocently enough. There was a bland comment about weather, or more precisely, a comparison of the temperature of where we were, to where they were (a mere 200 miles away in Maryland, nothing to reign in National Geographic about). Then a bad, often sexist, joke is dropped. You might fake laugh because, at the time, it seems only the polite thing to do. And then, just like that, they have you. In a drunken haze of innuendo and frivolity, you hang up the phone, satiated, and bemused. Moments later you realize that in one whole hour, nothing had really been accomplished, and that that phone call just cost you 200$. 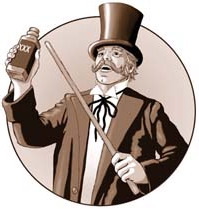 The snake oil salesman of today wears a stripped J Crew tie, carries a laptop, and is glued to his cell phone—but is no less insidious, and no less unctuous. They distract their prey with flashy graphics, complex diagrams, and woo you with fanciful unrealistic promises. And before you know it, they are on your payroll permanently, a fixture on your budget. You may have first thought you were purchasing a temporary piece of plastic PVC piping from Island Plastics to fix a leaky system, but in the end, they are that costly plumber with the low hanging size 42 jeans, but who decides to move into your home. What you never realize is that this plumber knows just as much about plumbing as you — that is, nothing at all. But, he sells his ignorance much better, and towards a more lucrative—more invidious—profit. So now that Iâ€™ve given my two-weeks notice at my current place of employment, I can finally unleash all my repressed work-place frustrations onto my website, with impunity. Now who will be my first victim? But alas, the chilly office misanthrope who sits 5 feet above my head, sealed to the ceiling, has just kicked on. It bellows a windy suspiration of icy cold air, making my arms goose-up uncharacteristically in the hot August month. Outside, the air is a balmy 80 degrees, but inside this office, itâ€™s always a frigid 60 — making the need for refrigerators in the office almost superfluous. This pernicious vent! I canâ€™t turn it off. I canâ€™t adjust the temperature control. And no one knows why. Denis, the IT Manager, and I, were discussing crawling in, past the drop ceiling, and deactivating the vent. But that was riddled with problems, one in particular being: we donâ€™t know how. Our final decision, was to take heavy folders and stuff them into the vent, in effect to block the path of air from exiting it. The result: a still frigid office, with a vent stuffed with heavy folders in it. No effect! The vent laughs that evil villain laugh. Eventually, the strength of the air that flows out the vent caused the folders to shift around in place; now the folders are off to the sides, jutting out at the wrong places; two are threatening to fall down at any moment. People that stop by the office to visit feel it their duty to throw out a comment about it. One lady, Rosy, after seeing the disheveled folders hanging off the vent said â€œWhat theâ€¦.? Whatâ€™s that a RISD design?â€. It sure could be. I havenâ€™t taken the folders off the vent. That would mean letting The Vent win. Iâ€™m too sore a loser and ruefully stubborn to let that happen. Withdraw my folders from what I know is a losing battle, regardless of the escalating casualties, and non-existent exit-strategy? Iâ€™d rather die trying. So until then, I guess I will just continue to wear a sweater in the office (in summer), and continue to make the periodic trips to The Outside, where the climate is less harsh and tolerable and where it feels less like the setting from March of the Penguins. Two more weeks, and one reason why Iâ€™m counting the days. So. What’s new with me? That’s okay, I’ll tell you anyway. I just got a new job! Starting August 29th, I will be a programmer for a Travel Firm in Pawtucket. Alright alright, it’s a Travel Agency (it just doesn’t sound as cool). Lemme tell ya, working from home is exhausting. The commute is about 5 steps from my bed. The commute back, depending on traffic, which is usually not a problem, is another 5 steps. I was watching the Godfather II and III while working (Thank you Mark). You know, maybe I shouldn’t say too much, lest I be another one of those poor souls that have been fired by their blog. Which is another topic in itself that I want to address one of these days. But in my defense, I did do some work. I was on top of the work-emails with “lightning quickness”. I missed my one work-related call from “The Chad”, who should know better than phone an IT person. Email people! Email is the way to reach us! And while I was “hard” at work in my room, I heard the sounds of grinding, and the buzz saw did snarl and rattle, snarl and rattle. My parent’s balcony is being renovated. It’s a big job. We’re closing the entire balcony, putting up windows, it should be nice. And the work is being done entirely by one man. His name is Mohammed. And, like the sultan from Aladdin, “I’m an Excellent judge of Character”. But no really, I am. And Mohammed so far is turning out to be one of the most honest carpenters we have had work for us, and in the words of Hamlet, “… to be honest, as this world goes, is to be one man picked out of ten thousand.” How true. Starting next week, and for a limited time, I’ll be one of those “cool” IT guys that works from home (maybe I should put “works” in quotes too.) Yes, starting Monday I’ll be chilling at home, sporting the absolute minimum in personal hygiene, and doing all that office-work-stuff on my laptop from all sorts of exotically domestic locations, like say… the backyard, the balcony, my room, in front of the tube, on the porch (aka, the stoop), and maybe– just maybe– from the desk in my room–but that’s highly unlikely. Working from home provides many benifites such as being able to work and take care of your kids and not have to worry about putting them in daycare. You can making money from home. There are plenty of job opportunities for the at home parent.